I have been busy with all sorts of things the past few weeks. One of them was developing a flowchart for use in hard to make clothing purchase decisions. One of the hardest things about keeping a concise closet is practicing thoughtful shopping. Many of us go out shopping for clothing, either for fun or because we need something specific, and often come back with more than we set out for. For many, this can be a difficult process to navigate. Whether it is a matter of self restraint, thoughtfulness, or simply establishing a budget. 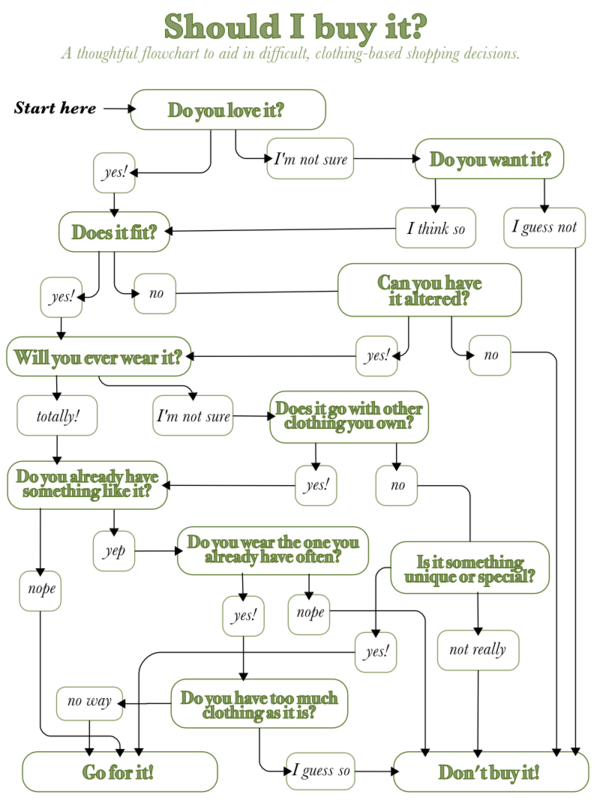 The flowchart above gives you an idea of the line of questioning to utilize before deciding on a clothing purchase. Sometimes, even the act of questioning the purchase is enough to get you thinking that you might not need it. However, an adamant decision not to buy anything can often result in spending the next day pining over a garment that you passed up, only then realizing that it could have been really fun/practical/transformative/applicable for a specific event. Affordability Sometimes we love something that is simply not in our budget, though it is important to remember that just because something is expensive doesn't mean you can't afford it. You have to make the decision about whether or not the money spent on a garment will be a good investment. At this point, we often have to make compromises (why not buy the one coat you need, and pass on three cute dresses you will hardly have occasion to wear?) or save up for a needed or much desired purchase. The investment you make in a garment can strengthen your respect for an item and hopefully encourage you to take good care of it. Supporting Small Businesses and Craftspeople A situation in which I can often justify a slightly-un-affordable or redundant (as in, you already have something like it) purchase is in the case that doing so will support a small clothing business or contribute to the lively hood of an independent designer or craftsperson. So, you love tailored jackets and you have plenty, but purchasing the gorgeous handmade felt blazer created by a local artisan doesn't sit too high in the thoughtless purchase ranking in my mind. The fact that you are overbuying is compensated by your support of these small industries. Sometimes, however, editing can result in the feeling that you have too few clothes. This my friends is the fun part. It is at this point that one can engage in the most thoughtful, considered, and arguably enjoyable type of shopping: looking for exactly what you need, in your size, not stopping until you find something that you love. Next up: Profiling My Own Wardrobe. Yikes!